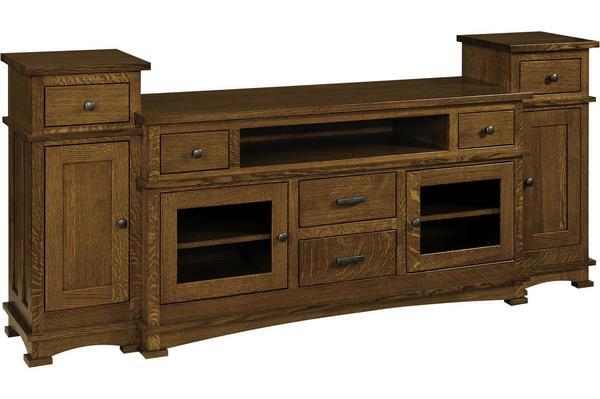 Our Amish Kenwood TV Stand with Towers has a cool contemporary design that provides lots of storage. Great for a living room, media room, or office, this console has six adjustable shelves -- one behind each glass door, and two behind each wood door located in the tower. Additional storage comes in the form of six drawers that fully extend and an open shelf. The top of the towers, a great spot for speakers or decor, and the long center top (built for a 55" television) are one-inch thick. The base features gentle arches that add character to the solid wood design. Customize this piece by choosing from a variety of wood, finish, and hardware options, as well as the option to add a power strip for easy access to electrical outlets.